Been a long time since I posted, and a lot has happened in the interim. Instead of parceling out my thoughts over several days, I decided to just throw them into a single long post. Apologies for some rambling, I hope to return soon with more detail on the more important issues highlighted below. Chip has taken over as GM of the Eagles (functionally). Thus, in order to adequately evaluate the team’s decisions, we need to get one thing very clear: It is entirely possible that Chip is a great coach but a terrible GM. I’m not saying that’s the case; we don’t have nearly enough data to make that judgment. However, everyone needs to understand that those are two separate positions, requiring completely different skill-sets. Additionally, you can absolutely be a huge fan of Chip Kelly the coach, but hate Chip Kelly the GM. That might be too much nuance for some fans, but it’s the way it is. I happen to think Chip Kelly is a great coach. Time will tell whether he can also be a good GM…but we do have a few decisions to start looking at. I’m intrigued by Sam Bradford, but there’s no question the Eagles paid too much. I was always among the bigger Nick Foles fans, but recognize that he was never going to be one of the best QBs in the game. There’s really no argument regarding Foles’ performance last season: it was bad. Not Blake Bortles bad, but certainly appreciably worse than what you’d like from your QB, and a far cry from his 2013 season. Foles ranked 20th in Adjusted Net Yards/Attempt (5.93). He ranked 14th in QBR (62.21). 27th in Rating (81.4). Of course, he did that behind a really bad offensive line and against a erasable difficult schedule. But qualification aside, he was comfortably in the bottom third of the league in terms of performance. So why do I think the Eagles paid too much for Bradford? Bradford’s career Adjusted Net Yards/Attempt is 5.17. His career Rating is 79.3. I haven’t calculated his weighted-average career QBR (and can’t calculate it because nobody knows the formula), but his BEST single season QBR was 50.28 in 2012. Bradford, by nearly any measure, has been a bad QB in the NFL. He gets a bit of a pass because he plays in a small market, was a former #1 pick (retains the pedigree associated with that), and has had a dreadful supporting cast for his entire career. Objectively speaking, however, he’s never proven himself to be even a league-average QB. Basically, there’s a very good chance Bradford doesn’t provide even marginally better expected performance than Foles. If you want to make the argument that Bradford has been held back by his cast, and that Foles, conversely, was inflated by his, then you might convince yourself that Bradford can, at best, be expected to be slightly better than Foles. Of course, slightly better is not enough for a 2nd round pick. I am confident that Bradford, if healthy, will outperform his career averages to date. Kelly’s offense has proven its ability to juice the QB’s stats. Still, if you think you’re going to be much more confident in Bradford than you were in Foles, I think you’re going to be disappointed. To summarize: I think Bradford can absolutely be a “good-enough” QB in Kelly’s system. However, I also think Foles and a 2nd round pick was far too much to pay. For those keeping track, that would seem to amount to support for Kelly the coach, but skepticism of Kelly the GM. I liked the McCoy trade. Culture issues aside, McCoy just wasn’t going to be worth what he was getting paid, and Alonso, if healthy, is a very good player at a position of greater need. In 2014, the Eagles allocated 8.22% of the salary cap to RBs, more than any other team. In 2015, the Eagles are allocating 6.94% of the cap to RBs, 5th in the league. Murray will be 27 next season. Matthews will be 28. 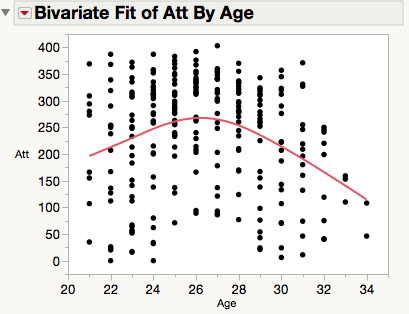 As you can see, on average, RBs peak (in terms of usage) at age 26. This is far from a hard-and-fast rule, but it highlights the fact that we shouldn’t expect “peak” performance from either player. The bigger concern is that we’re looking at a 1-2 year window where we can reasonably expect decent productivity from both players. Unfortunately, the Eagles signed Murray for 5 years and Matthews for 3. That means we’re likely looking at some dead money towards the end of those deals. That’s not a huge problem if Murray produces for 2-3 years. If he only has 1 good year, though, the Eagles are in a very tough spot. Matthews isn’t as significant, as I don’t expect him to get to the third year of his contract (when he’ll have a $5 mil cap hit). I liked the draft. Given where the Eagles chose and the price to trade up, I think the team did quite well. I certainly would have liked to grab several OL late, and would have tried to move down more in the later rounds, but those are very minor aspects. Whether a draft is “good” or not is almost entirely determined by the first two rounds. If Agholor and Rowe turn into impact starters, it doesn’t matter what the rest of the players do. If they don’t, the rest of the picks similarly won’t do enough to make up for those busts. Remember, it’s extremely rare for a late-round pick to turn into an impact player. So we can quibble over the later round selections, but they just aren’t that meaningful in the grand scheme. In other words, if you like both Agholor and Rowe, you should like the draft. If you don’t like them, you don’t like the draft. Also note that the draft has to be evaluated on its own basis. For example, one might say that the Agholor pick was a bad one, because the Eagles shouldn’t have needed a WR (they could’ve resigned Maclin or not cut DeSean). If that’s your critique, you’re still arguing past moves rather than this one. On the day of the draft, the Eagles could have used a top WR prospect, and it looks like they got one. I’m not satisfied with the offensive line, and can’t believe the Eagles didn’t make any other moves to address the positions. Allen Barbre is starting at RG. It’s possible he’s terrible. Over the course of a 7 year career, he has an Approximate Value of 7. Over his past 4 seasons, he’s appeared in just 23 games with an AV of 0. This isn’t some young player who is getting his first chance. Barbre has played for 3 different teams and will be 31 this season. He might be fine; Guard is a low-impact position. He might also be a big problem. Behind the starters are Gardner, Tobin, Kelly, and Molk. Not a confidence-inspiring group. This wouldn’t be quite as bad if the Eagles weren’t so heavily dependent on the OL. The offense is run-dominant, and the QBs aren’t good. Any weaknesses on the OL will be magnified. My concerns about the age of Peters and Mathis have more to do with finding their eventual replacements than they do with their expected performance this year. If healthy, I expect both to be good (Peters can be great again). But at some point, the Eagles will need to replace them, and as I’ve said before, having to replace 2+ starters on the OL in one offseason is not a good position to be in. As I mentioned in the RB section, Peters/Mathis look like they’re able to provide another 2-3 years of high-quality play (though I expect less from Mathis). When you take a step back and look at the roster, it really looks like the Eagles are a team whose “window” to contend is actually now. The problem? Sam Bradford is the QB and there’s still a gaping hole at Safety. I need to dig much deeper into this problem, but I think it’s perhaps the biggest question facing the team: Did the Eagles screw up the staging of their rebuild? I’ve discussed this before, but depth chart breakdowns are woefully incomplete if they don’t project over 3-5 years. You need to plan ahead, and have each unit of the team in close-to-peak form at the same time. Otherwise, you’re just a mediocre team perennially treading water and patching holes. I worry that’s where the Eagles are headed, but will come back with more detailed thoughts on the matter once I’ve had more time to think about it. Byron Maxwell is the most important acquisition the Eagles made this offseason. It was overshadowed by the moves on offense, but make no mistake: this is THE big one. Maxwell is 27 years old, and if he is truly a #1 CB, could have a huge impact on the defense for 5-7 years. They certainly paid Maxwell like a #1, which is why it’s so important he play up to that standard. Note that his contract is front-loaded, so the dead money isn’t too bad after the first 2 years of the deal. Maxwell has started just 17 games, with 6 interceptions and 27 passes defensed during that time. From PFF, QBs had a rating of 81.1 when throwing against Maxwell last season, WRs had a catch rate of 63.4%. (Note there are some minor discrepancies in the PFF data. I pulled from the leaderboard pages, not the individual player pages). Those are good numbers, but not great ones. Boykin, for example, allowed a rating of 77.2, on just 5 fewer targets. They were playing different coverage positions, of course, but it gives you some context to work with. Bradley Fletcher allowed a Rating of 107.6. Maxwell also played alongside Richard Sherman, the best CB in the game, and in front of Earl Thomas, the best S in the game. I don’t know what effect that had on Maxwell’s performance, but it’s worth noting. In theory, he should have been OVER-targeted last year, by virtue of being the “easier” CB to throw against, but he was targeted just 6 more times than Sherman. Regardless, Maxwell MUST be REALLY GOOD if the Eagles are to truly contend. He’s far from a sure thing. That’s what makes him the most important player for the Eagles this season. The above issues all point to one unavoidable conclusion: Chip has a LONG way to go to prove he can be a good GM, and if he can’t, it won’t matter how great a coach he is. To date, none of the moves he’s made are definitively “wrong”, but they’re not “right” either, and several of them seem more likely than not to prove unwise. That’s enough for now. I really just wanted to throw a lot out there, and drill down in more detail later. I think 1 mistake many makes when evaluating QBs statistical is that, most of the QBs numbers are a function of his WRs and the play calling. Sure HoF QBs can overcome bad play calling, but only to a degree. Just see Peyton Manning the first few games in Denver when they tried using a different offense than what he was used too. Also, one has to trust Kelly the coach in that Bradford is a better fit or Kelly the GM wouldnt have made the trade. The staging the rebuild question for me is one of the more interesting ones. It’s one I’ve been thinking about the past few years with Shady getting older (and even with all the other crap going on last year, I think we saw Shady start to dip). At the end of the day, you’re never going to have all your star players at their peak. You just need enough. The QBs, WRs, and at least Ertz out of the TE set can grow together, which is good. The RBs are obviously aging, but the reality is that it’s one of the more plug and play positions in the NFL. If we get one OL really early next year in the draft (or maybe FA), the line should be good – Johnson and Kelce +1 is pretty good stability for an OL. The Secondary should be ok, assuming a couple of our DBs currently around pan out. Jenkins and Maxwell might be nearing the end, but they won’t be over the edge. Barwin will probably be in the same place, but Kiko and (hopefully) Kendricks are solid. And our D-line will be in its prime. The big factors (kind of obviously) are QB and secondary. I think the offense can stay top-5 (while being more consistent with a more accurate QB and N/S running game), and I’m hopeful the D can crack the top-10 (which is partly from improvement in the secondary and a more consistent offense). Certain pieces need to develop right, but it looks like the blueprint is in place. And after all, if Bradford can keep us in the top 5 with some more consistency, that’s essentially all the rebuild we need to at least compete every year.